Paramount Mining Corporation Limited (Paramount) is engaged in the acquisition and development of interests in diamond exploration properties within Western Australia, Ghana and South Africa. 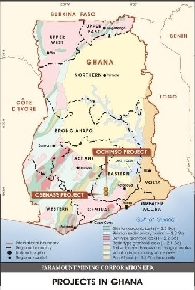 The Company's projects in Ghana include Osenase project and Ochinso Project. 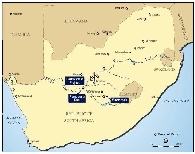 In South Africa the Company in agreement with Rox Resources Limited acquired twelve projects with granted tenure, including two alluvial diamond projects and other ground containing poorly tested diamondiferous kimberlites, including the Z1 pipe up to five hectares in area, acquired through De Beers. In Australia the Company carries on its operations on Ullawarra project and Ellendale tenements. Asian Activities Report for March 24, 2011 includes: Paramount Mining Corporation Limited (ASX:PCP) has signed a comprehensive Memorandum of Understanding with PT Antam (Persero) Tbk (ASX:ATM) for potential coal joint venture projects in Indonesia; Genesis Minerals Limited (ASX:GMD) is to raise A$1.845 million to fund the Dinamarquesa and Cerro Verde Projects in Chile; Aphrodite Gold Project (ASX:AQQ) announced an upgraded resource of 1,033,000 ounces gold at the Aphrodite Gold Project in Western Australia; Avalon Minerals Limited (ASX:AVI) reported significant high grade copper intersections from Viscaria Copper-Iron Project in Sweden. A clear white diamond from a sample associated with an anomalous feature that may represent its volcanic source has been recovered by Paramount Mining Corporation (ASX: PCP) from its Wood River Project in Western Australia&apos;s Kimberley Region. Further testing has lifted by 36% the number of diamonds recovered by listed Australian explorer, Paramount Mining Corporation Limited (ASX code "PCP") from its Ochinso Project in Ghana, West Africa. The project area is located within the Birim Diamond Field, which has historically produced over 100 million carats of diamonds. Field results from Paramount Mining Corporation&apos;s Ochinso Project, southern Ghana, from prospecting pits distributed over the entire project area, show that diamonds are widespread over the tenement. The project area is located within the Birim Diamond Field, which has historically produced over 100 million carats of diamonds. A major drilling programme at Paramount Mining Corporation Limited&apos;s (ASX: PCP)Ellendale Project in the north of Western Australia has confirmed the presence of lamproite, a rock type which can host diamonds, over a large surface area. Five diamonds, measuring between approximately 1 - 2.5 mm in diameter, were recorded from the first pit excavated at Paramount Mining Corporation&apos;s Ochinso Project, southern Ghana. Another diamond was recorded from a second pit, of three completed to date. The field report from Paramount&apos;s geologist states that the first pit also contained four flakes of gold (dimensions unspecified) the shape of which suggests that the source of the gold is not far from the present location. Drilling has commenced on a large lamproite target at Paramount Mining Corporation Limited&apos;s Ellendale Project in Western Australia. The location lies around 19 kilometres northwest of Kimberley Diamond Corporation&apos;s Ellendale Diamond Mine. Paramount Mining Corporation (ASX: PCP) is pleased to announce the proposed acquisition of up to twelve additional diamond mining projects in South Africa in a multi-staged transaction with ASX-listed diamond explorer, Rox Resources Limited (ASX: RXL). New results from Paramount Mining Corporation Limited&apos;s Ullawarra Project in Western Australia have confirmed a further three areas of key interest, bringing the total to 11 positive areas out of 30 follow-up subdivisions. The potential for part of its key diamond acreage in Ghana to also yield gold mineralisation is to be tested by ASX-listed diamond explorer, Paramount Mining Corporation Limited (ASX: PCP).